The lives of six female superheroes and the girlfriends of superheroes. A ferocious riff on women in superhero comics. 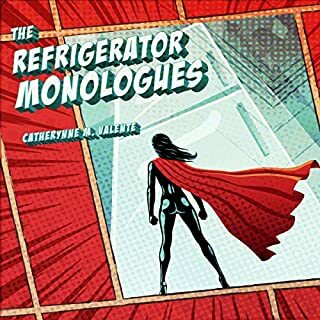 From the New York Times best-selling author Catherynne Valente comes a series of linked stories from the points of view of the wives and girlfriends of superheroes, female heroes, and anyone who's ever been "refrigerated": comic book women who are killed, raped, brainwashed, driven mad, disabled, or had their powers taken so that a male superhero's storyline will progress. 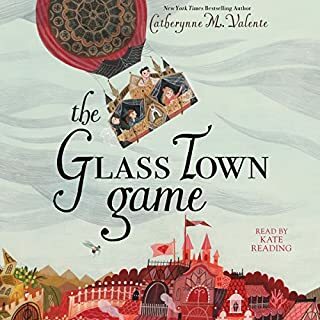 Inside a small Yorkshire parsonage, Charlotte, Branwell, Emily, and Anne Brontë have invented a game called Glass Town, where their toy soldiers fight Napoleon and no one dies. 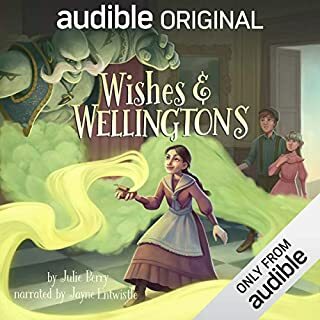 This make-believe land helps the four escape from a harsh reality: Charlotte and Emily are being sent away to a dangerous boarding school, a school they might not return from. But on this Beastliest Day, the day Anne and Branwell walk their sisters to the train station, something incredible happens. "Where have all the dragons gone?" Explore the crazy, creepy land called Discworld, where you'll discover that the dragons aren't asleep or dead - they're dormant, packed in like huge, scaly sardines. Rhiow seems a perfectly ordinary New York City cat. Or so her humans think - but she is much more than she appears. With her partners Saash and Urruah, she collaborates with human wizards, protecting the earth from dark forces and helping to maintain the network of magical gateways between different realities. Understanding someone who belongs to another species can be transformative. No one knows this better than author, naturalist, and adventurer Sy Montgomery. To research her books, Sy has traveled the world and encountered some of the planet's rarest and most beautiful animals. From tarantulas to tigers, Sy's life continually intersects with and is informed by the creatures she meets. This restorative memoir reflects on the personalities and quirks of 13 animals - Sy's friends - and the truths revealed by their grace. September misses Fairyland and her friends Ell, the Wyverary, and the boy Saturday. She longs to leave the routines of home and embark on a new adventure. Little does she know that this time, she will be spirited away to the moon, reunited with her friends, and find herself faced with saving Fairyland from a moon-Yeti with great and mysterious powers. it wasn't as good as the first book but definitely better than the second one. i get the author have a great imagination and master of words but honestly sometimes it get a bit confusing that i have to read the same paragraph twice to understand what happened. i really wish she would stop narrating her books. I would, have, and will again. While I still think the first book is so far the best in the series, the first book is -also- one of my favorite books I've ever read, so it's a bit of an unfair comparison. This book is incredibly clever, and while it is very funny, it is also a touching story. It also brings back the author as the narrator, which is -fantastic-. 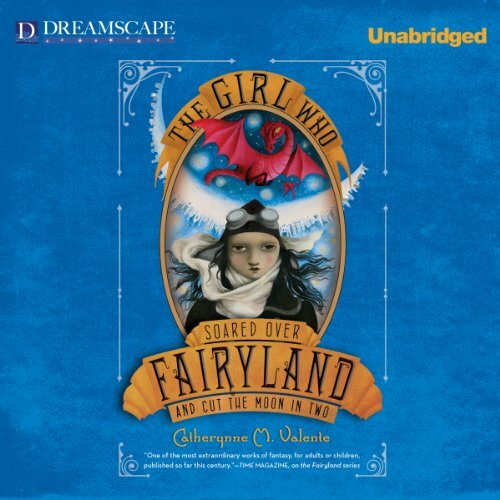 What was one of the most memorable moments of The Girl Who Soared Over Fairyland and Cut the Moon in Two? One of the most memorable moments is when the yeti punches the car on the moon and the events immediately ensuing. 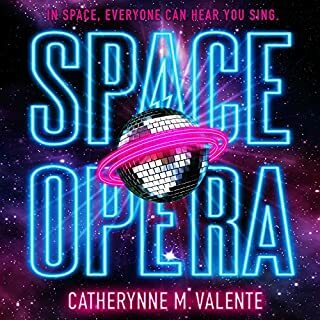 Seriously though- do you need to hear more than that, in this book (with a touching and well-crafted story), a yeti punches a car on the moon? Isn't that -alone- enough to get you interested? 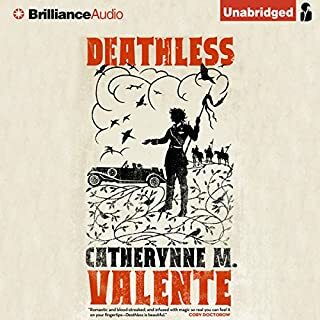 Which character – as performed by Catherynne M. Valente – was your favorite? I love September to death. It's hard between her, Saturday, and A-L, but I think September wins out. There's a good one at the end, but in lieu of that because of spoilers, I'll pick the one when September meets her younger self. I really liked that moment- it was a neat connection, and really nicely encapsulated September's deep wishes. 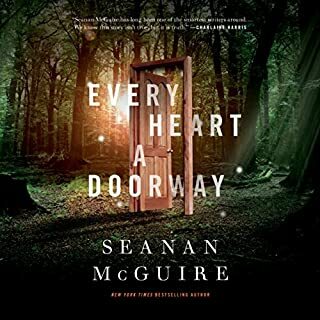 This whole series is fantastic- the author is simply amazing, both as an author and as a narrator. I am very glad she came back for this book after not narrating the second, and I hope she continues. She is a really gifted writer- very clever without being pretentious.